A screenshot of leaked details in an iPad user guide. APPLE appears to have accidentally confirmed new features on the iPad Air 2 and iPad Mini 3 ahead of the official launch tomorrow. Screenshots of the manufacturer's iPad User Guide for iOS 8.1 on iTunes taken by 9to5Mac contained photos of the latest devices, confirming the presence of Touch ID sensors. The revamped home buttons will appear on both tablets and were previously seen in leaked photos published by the Apple.club.tw blog. Touch ID is already available on the iPhone 5s and later models, allowing users to use their fingerprint as a password. 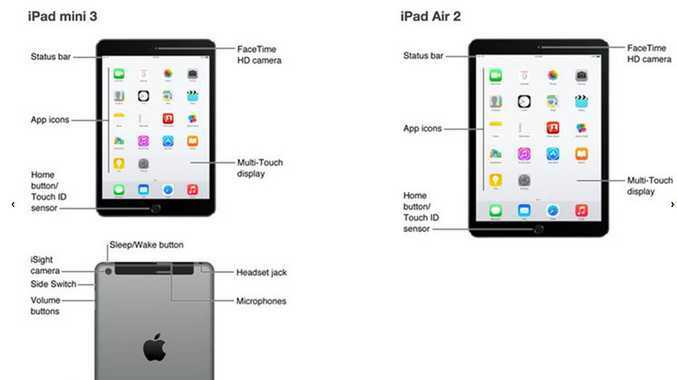 The user guide pages, which since appear to have been removed from the downloadable document, also showed almost identical designs for the new iPad and iPad Mini to their predecessors apart from a gold colour option. A more powerful A8X processor is also expected, along with improved camera optics and a burst shooting mode on the Air that was first introduced with the iPhone 5s. The leak on Wednesday happened shortly after Google unveiled its new Nexus TV, phone and tablet devices. Apple's new iPad and iPad Mini lines will be officially unveiled on Thursday (UK).